School Board Ann Wasson submitted a point of view column to the Duluth News Tribune heaping abuse on Landscape Architect Kent Worley for point out flaws with Ordean site. He recently replied to her. Thank you for this opportunity to clarify the several points we all need to become aware of for the Ordean site. For your convenience, your DNT opinion letter is shown in black print with my related reply notes shown in red. As a School Board member, I’m honored every day that I was elected to make good decisions on the community’s behalf — even if decisions aren’t always easy to make. The long-range facilities plan is a great example. It would have been easy to keep every school open, to ignore critical repairs, and to tell another generation of students the political climate wasn’t quite ready to improve education. But rather than continue to delay needed investments in facilities, I am proud my board colleagues and I supported a bold plan to improve schools. But some people want the investments to stop. · I have never proposed ‘stopping the investments’ as you suggested. The EastCentral Proposal which I have supported proves this, and it offers a viable easterly high school alternative which clearly outlines the many specific reasons this will serve ISD and the city far better. It is always been important to offer an alternative; you did not hear me say ‘stop’. You may also want to learn of the alternative Site Plan for the Ordean site that I prepared and gave to Jeff Schlitz June, 2007--- it solved many of the site problems at the Ordean site including the safety issues we are discussing here—the alternative plan was ignored. And, at times, they make ridiculous claims. Kent Worley made such a claim in his April 9 commentary in the News Tribune, “Student safety cannot be resolved at Ordean site.” He suggested Duluth School Board members were ignoring the safety of students. · The safety issues are stated below, and these issues have been stated and re-stated, but safety is important enough to discuss again. · There is extremely limited space for parents to stop their cars along 40th Avenue East to unload and load students In fact there is space for only 15 cars at most [didn’t the Traffic Study state space for 101 cars to load would be necessary?] Where will others go with not having enough space to even stop the car? They will go to the dead-end bus drop lane, and that is exactly where you do not want them to go. The reasons are safety—students walking between incoming and leaving buses, and incoming and leaving cars. Cars entering and leaving parking lots should not be mixing with the buses, but because the site is so small, parking and buses and parent cars will have to use the same drive. This is an absolutely wrong way to safely deal with students, cars and buses—they need physical separation. Others typically try a quick stop and drop along Superior Street in the midst of its fast moving thru traffic. The few parking spaces for drop on 40th are not isolated as they should be with their own SEPARATED parent car arrival / stop / waiting / parking activities which normally occur. Thru-traffic vehicles occupy driving lanes which are un-separated from drop/pick up lanes. Students will be walking across 40th Avenue East from its east side crossing to the school as parents attempt to stop along this east curb, again in moving traffic. · The issues I point out cannot be solved at the small Ordean site. It is not because you all have not tried to solve these issues. It is merely because there is not physical space to accomplish a successful plan. The needs exceed the ‘physical capability” of the small parcel with its setback requirements. This leaves few options to properly plan the facility. Why do people not understand this basic limitation? This is coming from my 43 year’s of registered professional land planning experience and a couple of degrees in exactly what this issue deals with—land planning. It also reflects living one block from Ordean and experiencing typical school needs and operations. · Discussing student safety, especially when involved with vehicles, is never a ridiculous topic. Worley’s accusation was both inaccurate and insulting. · My Intent is never to insult, but to educate with accurate information. I apologize if I have not written the safety problems in this greater detail in past correspondence. Thank you for such an opportunity to expand these concerns. Let me offer assurances that School Board members care very deeply about student safety — and have acted on that concern. The facilities plan modernizes building security [I have no doubt that building security will be improved; I have not questioned this---it is not the topic—safety from traffic is the topic] and greatly improves student safety at all Duluth schools. · Touting ‘new’ turn lanes which is standard procedure does not reduce these safety problems one bit. The city would required these as normal intersection provisions. Worley continued with an old and failed argument that the Ordean site is smaller than the 50 to 55 acres recommended for school sites by the Minnesota Department of Education. What he didn’t state was that the Ordean site is twice as large as either the Denfeld or East sites and is larger than the site of four of St. Paul ’s seven high schools. · That is 50-55 acres of USEABLE land compared to Ordean’s 11 acres of USEABLE land. This has been stated a dozen times, and MDE defines useable to exclude front, side and back and environmental setbacks as well as unbuildable conditions. · I have, over and over, stated that Denfeld and East have always both been inadequate in all the same respects. Do board members ever listen to City Council proceedings with Denfeld residents, particularly, begging the district or city to solve Denfeld parking limitations? Knowing this condition, wouldn’t it be good to avoid future identical problems? That is one of several objectives I have intended—avoid problems that we have experienced and are aware of—look at healthy, viable solutions and accomplish complete values for this community by creating something so good that people will want to move near such facilities—that is what is happening across this country. Wouldn’t this District want to accomplish the same? Instead neighborhood devaluation due to this proposal is occurring; several have moved—this must be what Superintendent means when he talks about ‘willing sellers”. Why are so many urban school sites smaller than the recommended size, such as the 29 acres used for St. Paul ’s newest high school? State guidelines recognize that the cost of land, urban development and unique geography are factors that must be considered in designing school sites. In fact, Duluth is mentioned as a city that should look at multi-story schools on fewer acres while sharing outdoor facilities with other public agencies. · Cost of land is NOT AN ISSUE by using the Central High School site because the existing 74 acre site is under ISD ownership. Worley’s specific concerns about traffic patterns around Ordean were equally flawed. · Speaking of traffic patterns, did the traffic consultants tell you that drivers will flow thru neighborhood streets [42nd, 41st, Gilliat Street and Luverne Street ] to fill and unload the new off-site Luverne Street parking lot which has an entrance/exit ONTO Luverne Street ? Did they tell you about traffic flow thru neighborhood streets so parents can return the same direction from where they arrived? · This is not flawed information; it is complete information--which does not show up in the traffic report. Does the traffic consultant tell you that student drop-off/loading curbs should not be mixed with thru-going traffic lanes as it will be on 40th Avenue ? Does your traffic consultant tell you that parents will stop along Superior Street to drop kids off — in the midst of that thru going Arterial Street ? Is anyone aware of the cars which have left Superior Street and 40th Ave. East crossing walks, hitting utility poles and coming close to smashing into the building? Does anyone know how many parent cars have ended up in the front yards of the neighborhood they drive thru to reach the school? Do you know our neighborhood has watched these exact things happen for decades along 40th Avenue East and Superior Street ? The district completed a traffic impact study as part of planning for the Ordean site. The study concluded that traffic concerns would actually be much worse during peak commuter travel hours than during peak school travel hours. Based on the study, six different steps were recommended to improve traffic flow at or near the intersection of Superior Street and 40th Avenue East . The study recommended specific improvements to the three. traffic entrance points to the school. Also, improvements in a London Road study were adopted. These recommendations are now being independently reviewed by the city of Duluth as part of the Environmental Assessment Worksheet process. · There are only two  traffic entrance points to the school. The school needs more than two. Worley’s commentary was typical of some of the full-time facilities plan critics who have emerged: Shoot first and discover facts later. · Now, Ms Wasson, you know this is not true. First of all I know the property, streets, homes, woods, creek and more after living one block from Ordean Middle School for 37 years, and I know its capabilities as a parcel of land, and I am here to tell you that the district is far ‘exceeding the carrying capacity of the land’, That is exactly what a land planner or landscape architect is responsible and obligated to advise. The land, the streets, the setbacks, the scale, the limited program of athletic facilities, the extensive million dollar retaining walls, the extensive underground water reservoir construction, the off-site parking, the lack of future building expansion space, the placement of service/delivery/garbage loading dock at a primary fronting street across from home sites---all these go to illustrate the ‘exceeding the land’s capacity’ to properly deal with needs of such an intense facility. 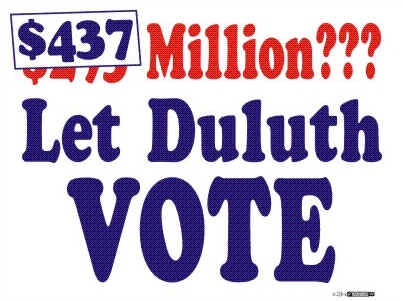 He and others could take a closer look at the safety and security issues in Let Duluth Vote’s Plan D.
· In the event you have missed it, I have had nothing to do with Plan B or D, AND my consistent recommendation has clearly been the EastCentral Proposal. Unfortunately the excellent Myles/Boman proposal was rejected. Their proposal, which I supported, could have finally united Duluth as one undivided city—that is the kind of leadership your board needed to have shown at that time. Based on its presentation before the School Board on April 28, Let Duluth Vote proposes to spend no money to improve school security. The group also recommended no money for improving traffic flow around schools. · Ms. Wasson-I have consistently stated that the East and Denfeld sites have always been substantially inadequate. 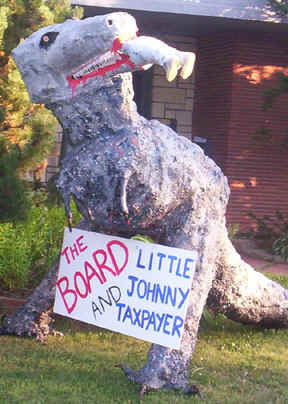 Again, do you ever listen to city council meetings with people pleading for some help in those neighborhoods? They are both examples of ‘exceeding the carrying capacity of the land’, and should never be used as examples, other than examples of what needs to be avoided in the future. Duluth residents want schools to be located where children are. · It is clear that the choices are either, to permit Eastern parents to have a closer, yet seriously compromised site [restricted size, inadequate parking, no expansion space, limited on site athletic/recreational facilities, neighborhood impacts, environmental impacts, shared street and loading curb], OR to permit Central parents to have a closer and uncompromised site [adequate size, adequate parking, expansion space, full complement of on site athletic/recreational facilities, no major neighborhood impacts, no environmental impacts, student loading separated from surrounding streets and a well used modern and established STE facility]. The choice should be very clear. In completing site designs for the long-range facilities plan, the School Board and its architects worked closely with community members to make sure each site plan met the community’s needs, including safety and security. · If they met, they did not listen; I am relating the exact current concerns and anticipated problems from the Ordean neighborhoods. The next time Worley returns to Duluth from his new home in Michigan , I invite him to join me for a tour of the Ordean site to get the real facts about Duluth ’s newest high school. · Safe access/entry off adjacent streets/roads INTO THE SITE, not just along side it. By the way, we remain 5-month Minnesota residents and 12-month Minnesota taxpayers. And we continue to care about our past Duluth community having seen ISD investments made and now to be abandoned, such as Nettleton, Rockridge additions and STE-Central High schools. Those were all School Board and 709 Administration decisions—perhaps there was not enough community discussion and conversations about options. There is nothing sinful, harmful, “insulting” or negative when someone shares experience, considerations and options. 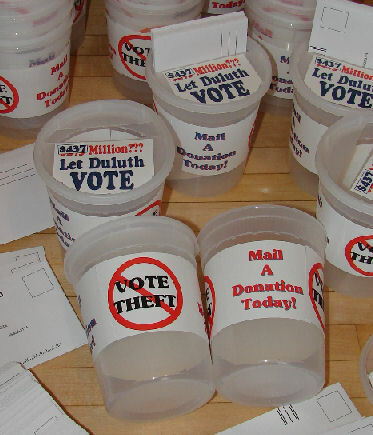 I would hope Duluth leadership would appreciate, not condemn this kind of contribution. Ask MnDOT, Federal Highway Administration,, the City of Duluth , past City Councils, Planning Commissions, Planning Department, Public Works, Downtown Development, Chamber of Commerce, local business leaders, and others if the expanded Interstate 35 considerations to look at alternatives resulted in something positive or negative.